A new and improved version of the networking giant's business model is already paying strong dividends (literally). Shares of Cisco Systems (NASDAQ:CSCO) rose 11.3% in February 2017, according to data from S&P Global Market Intelligence. The big surge fell near the middle of the month, when Cisco reported solid second-quarter results with a side of optimistic forward guidance targets. If that weren't enough, the networking equipment veteran also boosted its quarterly dividend payout by 12% and retired $1 billion of its shares. Cisco investors can now look back at a market-beating 25% return over the last 52 weeks. Cisco is reshaping its revenue intakes these days, raising the percentage of recurring contract sales from 26% to 31% over the last six quarters. 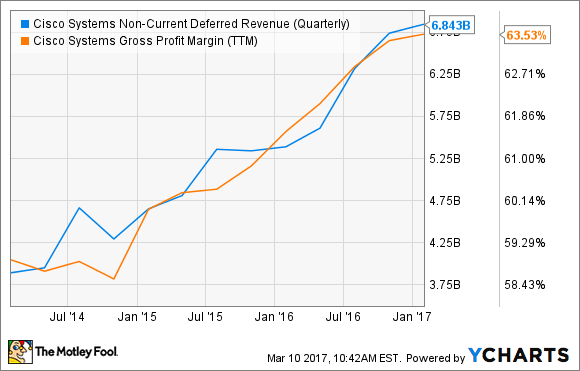 Because of this transition, Cisco's deferred revenue balance increased by 51% year over year in the second quarter. The end result is a more stable and predictable business model. Expect this trend to continue, as "everything is growing in that space," according to CFO Kelly Kramer. CSCO Non-Current Deferred Revenue (Quarterly) data by YCharts.